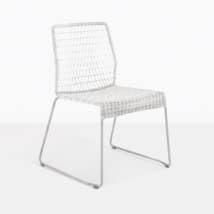 The Metro Outdoor Wicker Dining Chair is a gorgeous chair for the outdoors. 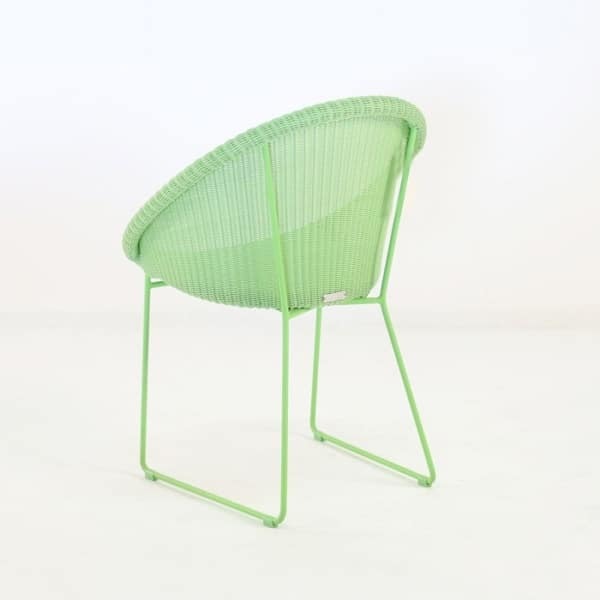 But perhaps the smooth green tone used in this variation of the Metro Chair is best suited to the colorful outdoor backdrop of the varied spaces our customers use their outdoor chairs. The vibrant green sets the scene, the quality materials complete the story; only your comfort and enjoyment of outdoor dining remains center stage as the rest blends into the background. The tight weave of Ecolene® synthetic outdoor wicker provides a beautiful contemporary seating surface. 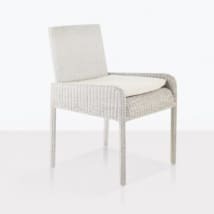 The dining height and low profile sides, paired with the excellent bucket feel of this wicker dining chair make it so comfortable. You won’t need a cushion with this comfortable dining chair, and then, the green color can really make a style statement, alongside your choice of dining tables and venues. Comfort, stability, style and a splash of Color make this piece, such a joy to use around a table full of delicious food and among great conversation and close friends. Ecolene® is a colorfast synthetic wicker fiber, built to last in harsh environments while still offering low commitment to maintenance. Often, hosing Ecolene® wicker down with clear water is all that is necessary to maintain the showroom new looks. 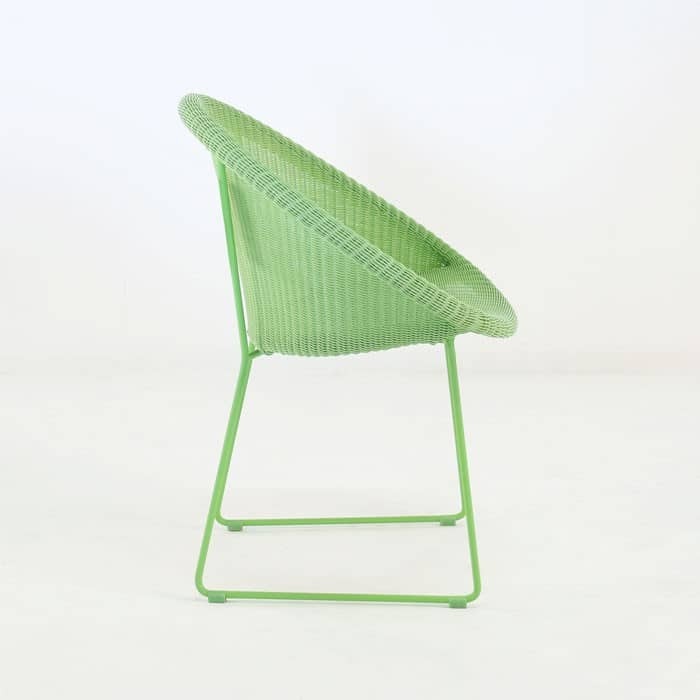 Pairing this intricate weave of green fibers around a solid steel frame powder coated in a subtly different green tone, offers an excellent transition of color to help you find the perfect mix of complement and contrast. Against a concrete table, or seated among the greens of your garden or lawn, this color can be simply stunning. But the versatility of the colors to work with any other furniture and the product’s materials are nothing short of amazing. 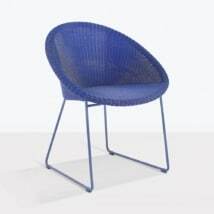 Teak Warehouse has an impressive mix of outdoor chairs, including outdoor wicker dining chairs in a variety of contemporary, modern and traditional styles, with materials ranging from high tech (like Polypropylene and Polyethylene resins and Aluminum), to natural wonders (like A-Grade Teak). Teak Warehouse has been outfitting backyards, back patios and other special spaces with premium quality outdoor furniture for commercial and residential clients for two decades. Our high quality furniture has been featured everywhere in the World in many locations, because our premium materials, impeccable quality, service and styles. Our In-stock guarantee and the fully assembled furniture we offer, means you get your outdoor furniture now, without waiting. Teak Warehouse Outdoor Furniture is ready to use, built by a master craftsman, finished to a perfect finish and gorgeous. We’d like to be a part of your outdoor space. Once you explore what we can offer, we are confident you’ll agree we are a worthy partner in your outdoor enjoyment. The Metro Chair epitomizes the solid fundamentals of the Teak Warehouse model. It’s stylish, comfortable, infinitely enjoyable, beautiful, made from premium materials and offers exceptional value. 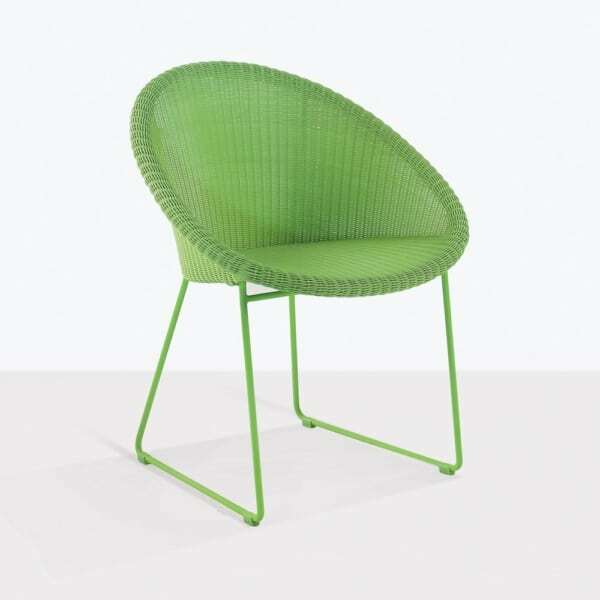 This Green Outdoor Wicker Dining Chair is a vibrant example of what we love: outdoor furniture that helps you be who you are, through style and design, comfort and longevity. The Metro Chair line is a spectacular and bold addition to your outdoor dining space, with a splash of color.